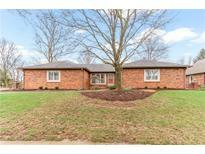 Below you can view all the homes for sale in the Tansel Wood Estates subdivision located in Indianapolis Indiana. Listings in Tansel Wood Estates are updated daily from data we receive from the Indianapolis multiple listing service. To learn more about any of these homes or to receive custom notifications when a new property is listed for sale in Tansel Wood Estates, give us a call at 317-754-2908. Beautiful,well maintained Ranch home in one of the best kept secret neighborhoods in Indy!Original owner & pride of ownership shows thru out.Great room really is great-28X19 with skylights,fireplace & good layout.The covered back porch overlooking a park like backyard is wonderful,you will not be disappointed when you step out there.Kitchen has been updated with granite counters,solid surface sink,stainless dishwasher & oven,electric cooktop.Kitchen/dining area is open & large with lots of cabinet space.Laundry is on main level.There could be a possible 4th bedroom in basement but no egress window,it does have a large closet & there is 1/2 bath that could easily become another full bath.Dry basement w double sump pumps. MLS#21631358. F.C. Tucker Company. This is a custom built home! Furnace is 1 yr. old MLS#21605230. Wall and Associates. These statistics are updated daily from the Metropolitan Indianapolis Board of REALTORS® Multiple Listing Service. For further analysis or to obtain statistics not shown below please call Highgarden Real Estate at 317-754-2908 and speak with one of our real estate consultants.